Blind Ego is the “solo” side project of RPWL guitarist Karlheinz “Kalle” Wallner. Wallner states that the Ego part of the name is derived from his desire to make music from a very personal space. He says that Blind comes from his total commitment to this solo work. The band assembled for this project is a prog super group. He takes on RPWL bandmate Yogi Lang as a musician and producer, but he is credited as a guest, instead of a full member of the band. 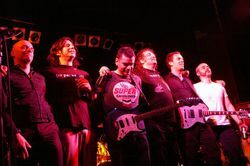 Tommy Eberhardt (from Legazy and Beatfreaks) plays drums, John Jowitt (from IQ and Arena) plays bass, and the vocals are split between John Mitchell (It Bites, Arena, The Urbane, and Kino) and Paul Wrightson (from Arena). Kalle states that John was best for the more “rock like” songs, while Paul was better for the more emotional numbers. There is another guest of note on this album too. While recording Wrigtson’s vocals, Clive Nolan also added his own backing vocals. I think there is a new law that states, Clive Nolan must be included in all Neo collaborations of the new millennium. For the live lineup, Rwin Reider replaces Eberhardt on drums, Wrightson takes the vocals alone, and Yogi Lang becomes full member on keyboards. Although there is a more straightforward approach than RPWL, the metal tendencies are still there. I believe the Neo truly comes from the influence of the rest of the band. Some say that it even smacks of AOR. So, basically what we have is a metal guy trying to make some more widely accessible music. The credentials of the musicians on this project are impressive. Does it work? That’s for the listener to decide.